Stephen Layton and "Polyphony" have done a superb job turning the music of Karl Jenkins into haunting, a capella choral pieces. For those who don't know this composer, and love choral music, it's high time you make his acquaintance. The music is accessible, but even saying that short-changes his art, as in my mind Jenkins transcends such thinking . . . [Jenkins's art] rakes the heart over a wide gamut of emotions that will leave you sitting in your listening room with chills racing down your spine. It is highly devotional but never cloying; mystical but never obscure; and so downright sincere that even those with the most hardened of hearts will come away finding common ground that they might never have thought existed. This is a great place to start for a phased-in approach to Jenkins's art. The sound at All Hallow's Church in Hampstead London is broad and clear . . . a must-have.
. . . superb performances . . . Polyphony under Stephen Layton is unbeatable especially in this sort of repertoire . . . They have been aided and abetted also by the superb acoustic of All Hallows Church Hampstead which gives the top line a sort of halo . . . these settings are also warm-hearted and communicative. They speak to all levels of musical society . . .
. . . Stephen Layton knows how to make these pieces take wing and gives them polish and sheen. The opening track, "I'll make music", tells us much about what follows. The words from the Old Testament are set to an appealing melody full of fresh air, the tune reminiscent in character of a Jerome Kern melody . . . Like Kern, Jenkins loves modulations and Polyphony's smooth performance has a glee-club enthusiasm and sophistication . . . Throughout, Polyphony and Layton once again demonstrate their innate professionalism and a genuine enjoyment in singing this repertoire. Layton's meticulously honed choir brings its expertise to the popular Welsh composer. 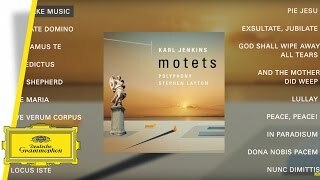 Listen to the audio sampler for Karl Jenkins' new album 'Motets'. As a composer and a brand -- a brand that stands for an epic sound that connects with people from all different age groups on a spiritual level - Karl Jenkins remains one of the most performed living composers in the world today. Motets is an intimate a capella album that features stunning new choral adaptions of Jenkins previous hit compositions and marks the year of Jenkins 70th birthday and fifty years of his career in music. The concept Motets goes back in time and celebrates his hits from the past in a newly arranged intimate sound -- accessible, performable, emotional.